The majority of the world now knows John Boyega as Finn, the Stormtrooper-turned-hero of Star Wars: The Force Awakens. For some of us though, he’ll always be Moses, the badass star of 2011's cult film Attack the Block, and the star just potentially teased a return to that world. Boyega dropped this tweet Saturday morning, which got anyone who has seen Attack the Block salivating. Joe Cornish, of course, is the film’s director and in the five years since that film’s release, he has yet to return to the director’s chair. He’s been attached to a few things, and written some others, but nothing as a director. Cornish remains on every geek’s movie wishlist though so, to see that he and Boyega have been talking is good news no matter what. But it’s really good news if the two were talking about a follow up to Attack the Block. Now, obviously, I’d love to see Cornish continue to push the envelope and create new things first and foremost. Boyega too. 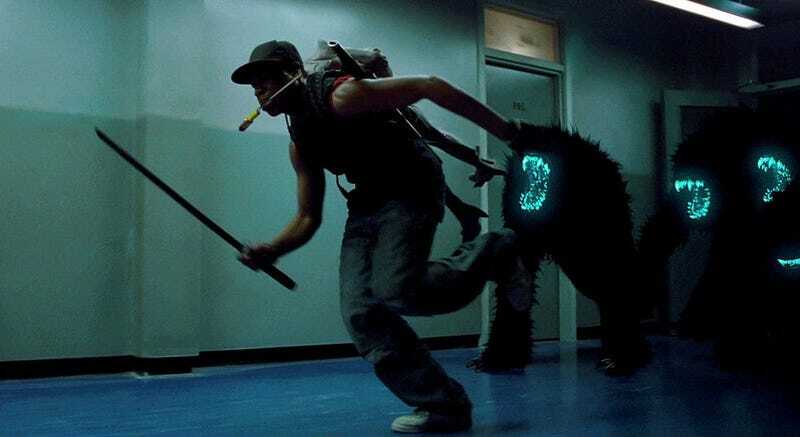 But the mere thought of an Attack the Block sequel is too cool to ignore. In the past, the star has teased he and Cornish’s ideas, which would continue the alien invasion and feature Moses in a larger role. Will that ever happen? Who knows. But something’s happening, and that’s cool enough. Haven’t seen Attack the Block? Well your weekend plans just changed.